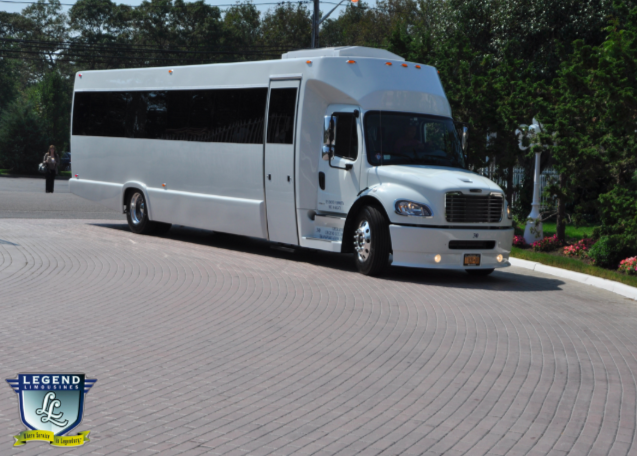 Comfortably seating 25-28 people, Legend’s Custom Designed Mack Edition 30 Passenger Limo Buses are something you have to see to believe. The Freightliner chassis and body are all white, with frameless windows that are tinted using limo darkness window tinting. Legend even took it a step further, and put color changing lights on the undercarriage, lighting the ground in a wide array of colors. The interior features are beyond belief. To start, the stainless steel ceiling is lit with Twilight stars and fiber optic lighting that can either gradually change from one color to another, or they can remain constant on the color of your choice, or they can even be set to dance to the music your guests are listening to. There is a total of 6 flat screen televisions: four individual 22” televisions mounted on the walls of the bus, as well as a 42” flat screen on the back wall, and a 32” flat screen on the front wall between the passenger and chauffeur. These televisions work on a DVD player, that is kept separate from the CD Player. The Grey/Black hardwood floors are slip resistant, to ensure stable footing. All of the seats feature a custom design that is black on the outside, with Blue/Silver inserts. Two stainless steel poles are securely mounted in the floor and ceiling to provide further stability, however, upon request, they are easily removable. Additional custom lighting includes color changing fiber optic on the walls and underneath the seats, 5 strobe lights, laser lights in green & red, which all look incredible with use of the onboard fog machine. The 3,000-watt stereo system includes two 12” sub-woofers and many speakers, creating outrageous sound quality. The bathroom includes a real porcelain bowl and a working wash sink.